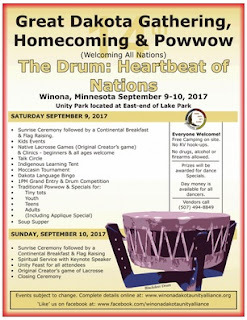 Today and tomorrow in Winona, Minnesota, the Winona Dakota Unity Alliance is hosting the Great Dakota Gathering, Homecoming, and Pow-wow all day today and Sunday, Sept. 10 at Unity Park (east end of Lake Winona). The event is a commemoration and homecoming, as well as an opportunity to educate people about the Dakota "Trail of Tears," when the Dakota were executed, imprisoned, and forcibly removed from their homeland (in present day Minnesota) following the Dakota War of 1862. Starting tomorrow, White Awake is hosting a three session (9/10-10/1) online workshop: Growing Roots Deeper Than Whiteness to Rise for Racial Justice. You can register (for a fee) at the link. The first session begins Sunday evening. If you would like to table at Fighting Bob Fest - La Crosse (Saturday, September 16 from 4 to 8 p.m. at the Oktoberfest Shelter in Copeland Park), please contact info@ourwisonsinrev.com or owrlacrosse@gmail.com. Donations will be accepted. You will need to bring your own table and chairs. Please spread the word to your members. Please also share the flyer and the press release.